I think I may have mentioned already that I am OBSESSED with my air-fryer. I hemmed and hawed about getting one. What about the counter space it takes up? Will I really use it, or will it just be something I love for a week and never use again? Isn’t it just a small convection oven? I’m so glad I asked for one for Christmas, and that Jeff got me the one he did. (Ninja brand.) I honestly can NOT say enough nice things about the air fryer. Worth every penny and every inch of counter space. It turns everything into “fun” food. I’ve developed a super easy, super crunchy tofu recipe that I make at least once a week. You can prepare an entire block of extra firm tofu this way and eat it in two or three sittings. Leftovers make an awesome topping for salads, curries, pasta dishes, pizzas, and as a taco or sandwich filling. So delicious and full of clean, lean, vegan protein! Press tofu for 3 to 12 hours in refrigerator. Once pressed, discard excess liquid and pat tofu block dry. Cut into little cubes or triangles. At this point you can marinade the tofu in a little balsamic, sesame oil, agave syrup, and spices. (Use whatever you have that would be a good flavor infuser.) OR, just skip the marinading step and go right to dredging the tofu. I’ve made this both ways and it’s amazing either way. Set up dredging station. Tofu cubes on one plate. Mayo on another. Seasonings and panko on a third, and a fourth plate for the breaded tofu. Dip tofu pieces into mayo so they’re coated, but not dripping. Then dredge in seasoned panko, gently pressing so breading adheres to cubes and so they’re completely covered. Place on the fourth plate. Once they’re all coated, air-fry at 390 degrees F. for 5 to 6 minutes. Gently flip. Air fry an additional 4 to 6 minutes, or until tofu is golden brown and crunchy. You may have to air fry the tofu in batches. I have a big air fryer with the ability to stack the tofu cubes, and I still do this in two batches. You don’t want to crowd the tofu. At this point you can plate the tofu and dip it into desired sauce, or wait for it to cool a bit and toss it in sauce to coat. 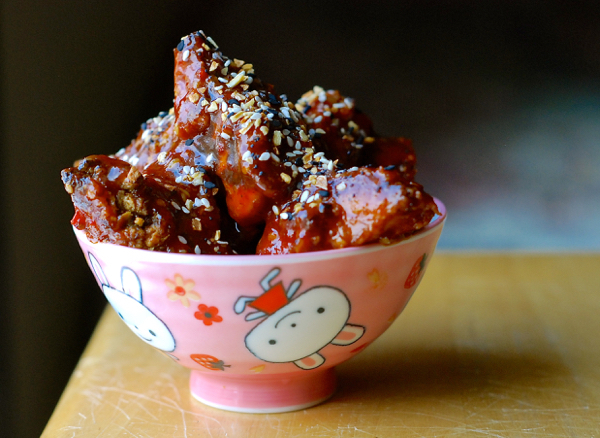 I’ve made this with orange sauce, teriyaki, bbq, and Korean BBQ in the past and all versions tasted great. If you choose to use Korean BBQ (as pictured above) you can either purchase your favorite bottled variety or make it homemade. 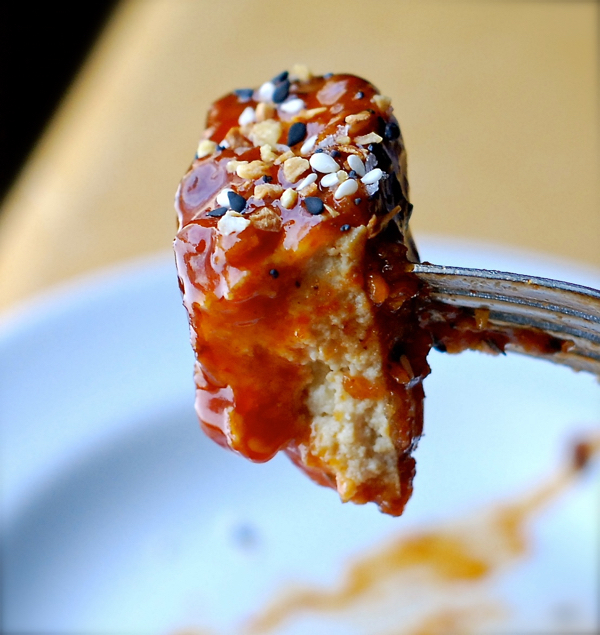 Sprinkle coated tofu with some sesame seeds or TJ’s Everything Bagel topping for extra flavor and crunch. Whisk all ingredients in a medium mixing bowl until well combined. Transfer to a glass jar with a tight fitting lid. This sauce will keep in your refrigerator for 2 weeks, or in your freezer for a year.